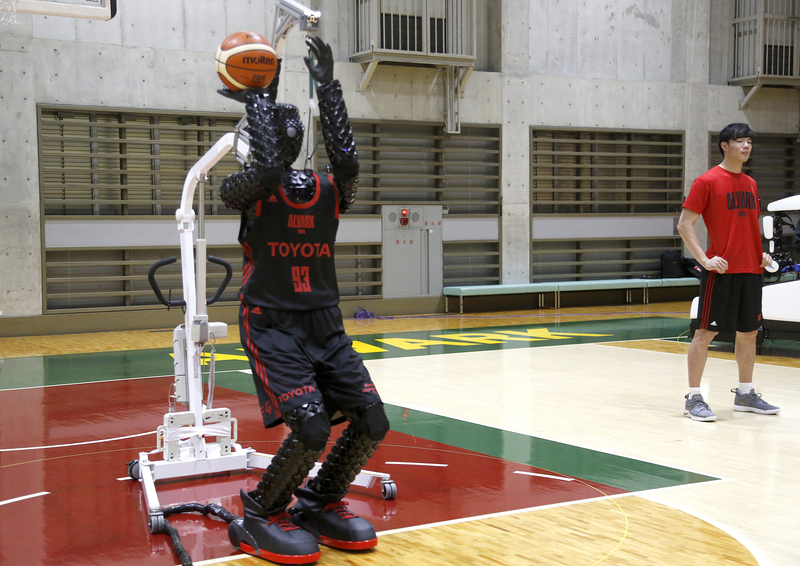 The 207-centimeter-tall (6 feet 10-inches) machine made five of eight 3-point shots in a demonstration in a Tokyo suburb Monday, a ratio its engineers say is worse than usual. 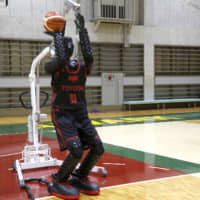 Toyota Motor Corp.’s robot, called Cue 3, computes a three-dimensional image where the basket is, using sensors on its torso, and adjusts motors inside its arm and knees to give the shot the right angle and propulsion for a swish. Yudai Baba, a basketball player likely representing host Japan at the 2020 Tokyo Olympics, took part in the demonstration and also missed a couple of shots. If the robot could learn a few more tricks, Baba said he is ready to accept the robot onto the team. “We human players are still better for now,” he added. The maker of the Camry sedan, Prius hybrid and Lexus luxury models has shown off various robots, including one that played a violin. Another, resembling R2-D2 of “Star Wars,” slides around and picks up things. At Monday’s demonstration, it handed the basketball to Cue 3. Experts say robots that can mimic human movements, even doing them better, could prove useful in various ways, including picking crops, making deliveries and working in factories and warehouses. To shoot hoops, the robot must have a good vision system, be able to compute the ball’s path then execute the shot, Khatib said in a telephone interview. Japan has been aggressively developing humanoids, including those that do little more than offer cute companionship. Toyota’s rival, Honda Motor Co., has its Asimo, a culmination of research into creating a walking robot that started in the 1980s. It not only can run, but also recognize faces, avoid obstacles, shake hands, pour a drink and carry a tray.